French prodco Xilam Animation has tapped Licensing Works! 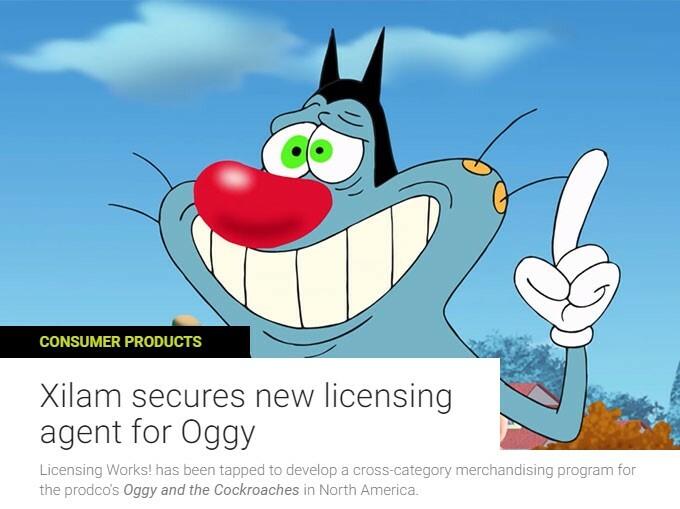 as its North American licensing agent for Oggy and the Cockroaches. The Vegas-based company will be tasked with creating a cross-category merchandise program inspired by the slapstick comedy toon for kids ages six to 11. Oggy and the Cockroaches is a 20-year-old animated series about a blue cat who battles three pesky cockroaches; it has racked up 1.5 billion global views on YouTube and has been distributed in more than 190 territories worldwide. Appointing Licensing Works! to rep the IP is part of Xilam’s strategic plan to grow the brand’s presence in North America. Sinclair Broadcast Group launched 100 eps on its US kids programming block KidsClick in June, and Netflix recently committed to a fifth season of the series. Existing seasons are available on Amazon Prime Video and SRC’s SVOD platforms in Canada. With the latest 78 x seven-minute season of Oggy now rolling out internationally, Xilam has planned a number of activities in France to celebrate the franchise’s 20th anniversary, including a themed escape room in Paris, animation workshops for kids, and an aquarium treasure hunt.